An “eelevator” designed and built by a team including Cornell researchers is helping American eels survive their harrowing journey from the Atlantic Ocean to the Hudson River and into the rivers of the East Coast. Hatched in the Sargasso Sea in the warm waters of the Atlantic Ocean, American eel larvae ride Gulf Stream currents north and enter North American estuaries as see-through “glass eels.” The migratory fish progressively gain pigment as they move inland, eventually becoming a brown or greenish color and growing to upwards of 4 feet in length. Volunteers stand on the Sparkill Creek Eelevator, a project seeking to provide passage for American eels over barriers in the Hudson Valley. Eels – with lifespans of up to 30 years and a large size range depending on their development stage – intersect with almost every level of the food web, from prey to predator, and are critical parts of the aquatic ecosystem, says Chris Bowser, an extension support specialist for Cornell’s New York State Water Resources Institute (WRI) in the College of Agriculture and Life Sciences. Dams and other barriers have placed ecological pressures on the American eel, drastically reducing numbers of the species. In the past, eel ladders and “trap-and-pass” devices have been used on the Hudson River to give the fish access to the waters above dams. But in what may be a first, a liftable version placed on the Sparkill Creek in Rockland County is providing a new way to assist eels on their migration. Residents of the town of Piermont approached Cornell staff at WRI and the Hudson River National Estuarine Research Reserve with an interest in getting eels above the dam at a local pond. 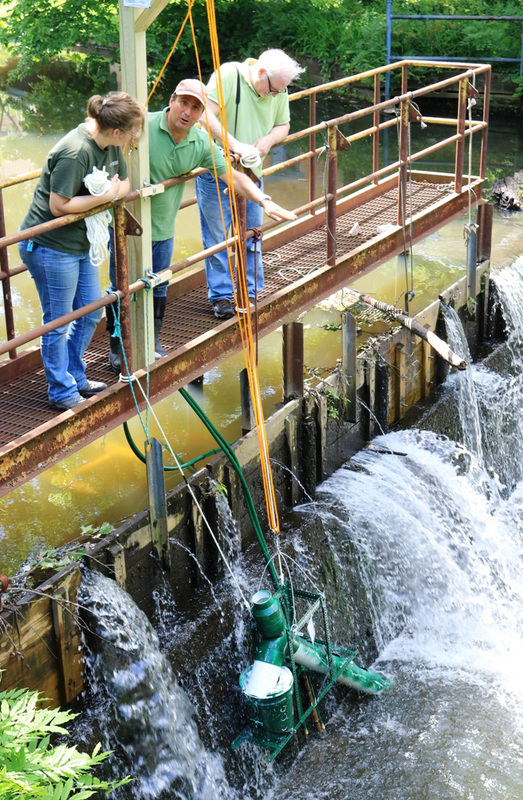 The lightweight device can be raised, lowered and checked for eels by trained volunteers. Migrating eels seeking a way above the dam can climb a short ramp lined with old netting and kept wet by hoses from above. These eels – most often about 3 to 6 inches in length and in the “elver” stage of development – enter a bucket of circulating water that is checked twice weekly by volunteers. Sizes are recorded, and the eels are released above the dam to continue their life’s journey. Since its inception in 2008, the Hudson River Eel Project has caught, counted and released more than 500,000 juvenile eels. The project has expanded to 14 sites, from Staten Island in New York City to Hudson River tributaries near Albany, and relies on volunteers to assess eel migration each spring and summer. Bowser said the “eelevator” concept could be expanded to more sites in the future.